We are a men’s barbershop chorus from Central Wisconsin with 60 members. We sing a cappella four-part harmony in the barbershop style. We are a part of the international Barbershop Harmony Society, formerly known as SPEBSQSA, dedicated to preserving the old songs of the barbershop style. We rehearse every Monday evening at 3500 Harmony Lane, Stevens Point. We start all rehersals at 7:00 p.m. Visitors are always welcome — call 715-344-5746 for more information. See the Contact page for a map. 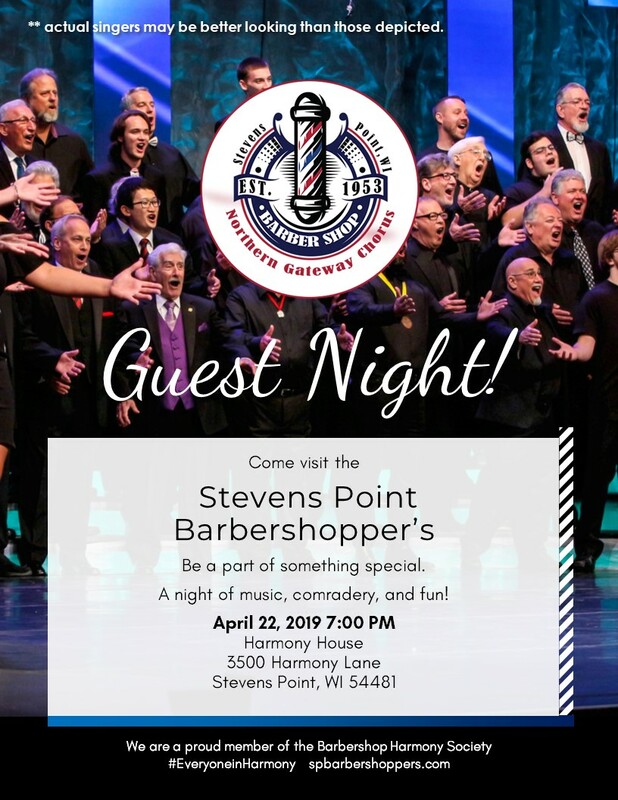 The Northern Gateway Chorus of the Barbershop Harmony Society will perpetuate and celebrate harmony in the barbershop style, promote fellowship and friendship among members, and provide the opportunity to experience the joy of four part harmony while spreading that joy throughout our community. Promoting a cappella singing in today’s youth. Allowing each member to experience the joy of hearing his own voice in four part harmony. Seeking and offering opportunities for community involvement. Promoting personal development through musical growth.